Garry Brooks and his wife Joanne planted a small vineyard in Sonoma in 2002. At the time, both Garry and Joanne were working in Technology. As the vines grew, it became clear (first to Joanne) that Garry’s passion was with the grapes, rather than with IT. In 2004, after serious soul searching, Garry left the safe and lucrative world of Technology to pursue his dream of making wine. He started as an intern in the lab at Ravenswood. His first harvest was an eye opener. Long hours, physical work, and coming home exhausted late at night. Garry was hooked. He stayed on at Ravenswood part time while he went back to school, eventually getting a bachelor’s degree in Viticulture and Enology from UC Davis. While commuting to UC Davis, Garry continued to work at Ravenswood making mostly Zinfandel, but also Cabernet, Merlot, Petite Syrah, Grenache and Syrah. He knew he wanted to make Pinot Noir, and was looking for the right opportunity. He got to make his first Pinot at Acacia during the 2007 harvest. He was responsible for vineyard sampling. He strapped buckets to his mountain bike and rode through beautiful vineyards in Carneros; stopping periodically to sample clusters along the way. From Acacia, Garry moved to Kosta Browne. The Associate winemaker, Shane Finely, was a fan of hiring Veterans. Garry’s service in the Navy paid off. He was able to turn a harvest internship into a full time job at Kosta Browne, spending two years working with Shane and Michael Browne. Garry learned the art of crafting small lot Pinots. He worked with incredible vineyards and some of the best vineyard managers in the business. He learned how Michael put his wines together. Garry was part of the team that helped make Kosta Brown’e 2009 Sonoma Coast Pinot Noir, Wine Spectator’s “Wine of the Year” in 2011. 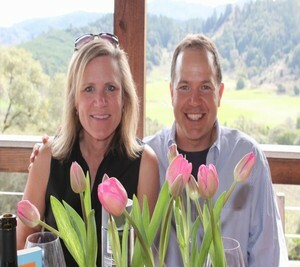 After Kosta Browne, Garry joined Dutton Goldfield as the Assistant Winemaker, working for Dan Goldfield. He worked with great vineyards in the Russian River Valley, but was also introduced to viticulture in Marin. Long a passion for Garry, making wine from grapes in Marin was a dream come true. With Dan, he got to know the unique geography, weather, and vineyards of Marin. In 2011, Garry and Joanne reached a cross road. After working harvests with others since 2004, and producing many great garage wines for friends and family, they decided that it was time to start their own commercial label. Brooks Note Winery was born.